My favorite prodect in the kitchen is a pair of sharp shears. They save so much time over knives and electric gadgets. I love my kitchenaid mixer. My latest favorite kitchen product is my Silpat pan liner. It makes baking and cooking so much easier, not to mention the simple clean-up. My hand or stick blender, many uses for it and it is convenient. It would be my food chopper. That would be my mandoline – it slices everything nice and thin, easily. I love my electric roasting pans! Ours is the Bullet so that my sons can make shakes on their own. My favorite item in my kitchen is my Kitchen Aid Mixer! And my food processor. Our knife set! I love them! My favorite kitchen item is my Kitchenaid stand mixer. One of my favorite kitchen products is my whisk. Today my favorite kitchen product is a spreader, which I used to make sandwiches. I like my saute pan, use it twice a day, at least. My favorite is my mixer. As I made a nice loaf of herb bread today, I was reminded how much I love my bread machine! Then I was reminded how important a good bread knife is. My favorite kitchen item is Kitchen Aid mixer. As I reached for my favorite spatula today, I realized that it is probably one of the most-used and most-overlooked tools in my kitchen. 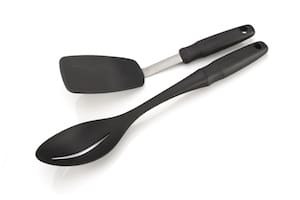 Their Spatula, Spreader looks like it would work well for frosting cakes. With the way some cuts of meat have been, a Meat Tenderizer would be handy to have around the house. Today I love my stoneware pizza pan! I have a favorite mixing spoon that I love to use for just about everything. Thanks so much for hosting this giveaway! I like my paring knife, use it daily. I love my ergo can opener! My favorite kitchen product has to be my food processor! My whisks are my all time favorite kitchen tools. Ergo can opener for me! my favorite kitchen product is my coffee maker, i would be lost without it. i love it so much, it’s always there for me, morning, noon and night! My cooking pot,I use it all the time! I also like my KitchenAid mixer. I like my steamer pot. I can’t live without my carving knives.